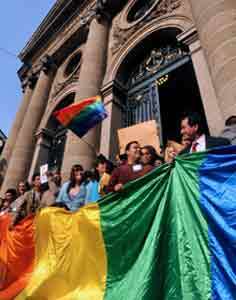 The mayor of Mexico City has refused to veto the bill introducing gay marriage, the Informador reported. Ebrard, however, has refused to overturn the new rules, which include specific rights for gays to adopt and are scheduled to take effect in March. Alejandro Rojas, the city’s tourism secretary said: “Mexico City will become a center, where people from all over the world will be able to come and have their wedding, and then spend their honeymoon here”. Earlier this week in South America, Argentina saw its first ever marriage of two men who had received a special support from state officials, though Mexico City will be the first capital city on the continent to enact laws allowing gay marriage. Members of the conservative National Action Party (PAN) say they will take an appeal to Mexico’s Supreme Court. “We will continue a fierce and persistent battle, and if necessary we will do it before the Supreme Court to safeguard the institutions and values of society such as family and marriage, which is the union between a man and a woman,” they said in a statement made on Tuesday.